Western blot analysis of extracts from Jurkat cells transfected with p56Dok-2 proteins, untreated or stimulated with anti-CD2 antibody, using Phospho-p56Dok-2 (Tyr351) Antibody (upper) or p56Dok-2 Antibody #3914 (lower). 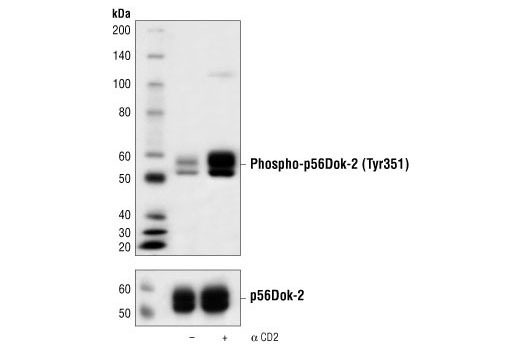 Phospho-p56Dok-2 (Tyr351) Antibody detects transfected levels of p56Dok-2 only when phosphorylated at tyrosine 351. The antibody does not cross-react with other tyrosine phosphorylated p62Dok family members. Polyclonal antibodies are produced by immunizing animals with a synthetic phosphopeptide corresponding to residues surrounding Tyr351 of mouse p56Dok-2. Antibodies are purified by protein A and peptide affinity chromatography. Docking proteins are substrates of tyrosine kinases that function in the recruitment and assembly of specific signal transduction molecules. There are five members in the p62dok family, p62Dok (Dok-1), p56Dok-2 (Dok-2, or DoK-R), Dok-3, Dok-4 and Dok-5 (1-3), characterized by the presence of an amino-terminal PH domain, a central PTB domain and numerous potential sites of tyrosine phosphorylation. Tyrosine phosphorylation of p56Dok-2 occurs upon stimulation of cells with a variety of stimuli, or in cells transformed by oncogenic tyrosine kinases such as v-Src and Bcr-Abl (3-5). Based on the presence of several signaling domains (PH, PTB domain, tyrosine residue and proline-rich regions), it has been proposed that the p62dok family act as docking proteins that link RTKs to signal transduction pathways. p56Dok-2 has been proposed to be a negative regulator of cytokine-induced proliferation in T cells (5). Phosphorylated Tyr351 of p56Dok-2 mediates an association with the SH2 domain of Nck (4). Master, Z. et al. (2001) EMBO J. 20, 5919-5928. Grimm, J. et al. (2001) J. Cell. Biol. 154, 345-354. Cristofano, A. D. et al. (1998) J. Biol. Chem. 273, 4827-4830. Jones, N. and Dumont, D.J. (1999) Curr. Biol. 9, 1057-1060. Nemorin, J.G. and Duplay, P. (2000) J. Biol. Chem. 275, 14590-14597.